54 Reasons Why Youngstown, OH, voters must VOTE YES Nov 4th, 2014 FOR charter amendment to ban #fracking in Youngstown - CLICK TO VIEW SLIDE SHOW. RADIO AD #1 Vote Yes! CLICK image to play ad. Radio spot #2 Vote YES! RADIO AD #3 Vote YES! VIEW the Community Bill of Rights as a PDF as signed by 2800 Youngstown City residents in the successful petition to place it on the primary ballot. A "YES" vote indicates approval by the voter and a majority of "YES" votes will cause the proposed amendment to be included as part of the Youngstown Home Rule Charter. A "NO" vote indicates disapproval by the voter and a majority of "NO" votes will cause the proposed amendment to be rejected and the Youngstown Home Rule charter would remain unchanged. Youngstown city residents voting "YES" on this May 7, 2013, primary ballot issue question would indicate an assertion of the right of residents of the City to local self-government, to pure water, clean air, peaceful enjoyment of home, freedom from toxic trespass, local self-governing rights and the right of residents to establish energy policies for future sustainability. 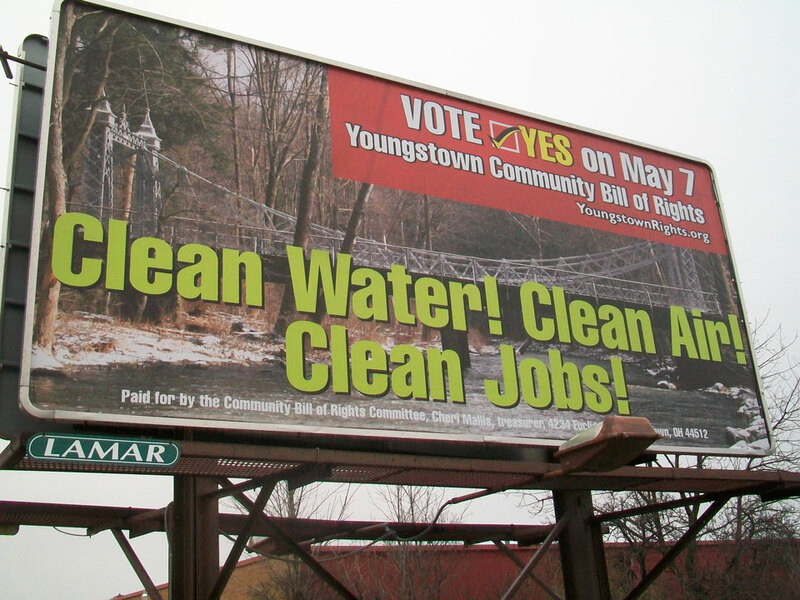 On Tuesday, Nov 4th, 2014, VOTE YES to amend the Youngstown Home Rule Charter so that the citizens can protect their drinking water, their air and their land. 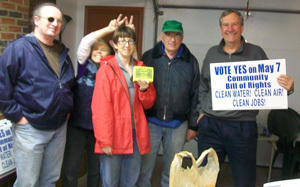 The citizens of Youngstown can vote YES on the Community Bill of Rights to prohibit toxic trespass in the protected drinking watershed of the Meander Reservoir, in residential areas bordering Mill Creek MetroParks and in the populated City of Youngstown. Effect of the Vote A “YES” vote indicates approval by the voter and a majority of “YES” votes will cause the proposed amendment to be included as part of the Youngstown Home Rule Charter. 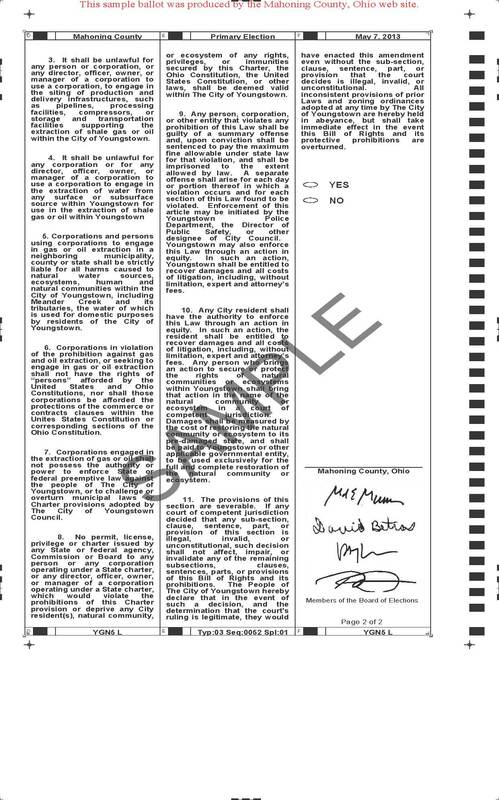 A “NO” vote indicates disapproval by the voter and a majority of “NO” votes will cause the proposed amendment to be rejected and the Youngstown Home Rule Charter would remain unchanged. What is the Youngstown, Ohio Community Bill of Rights? Youngstown is a “home rule” City. This means it creates its own laws on any topic not exclusively regulated by the state or federal government. The set of local laws that govern the City are collectively referred to as the City’s Charter. The Charter may be amended either by action of the elected government officials or through a citizen petition. 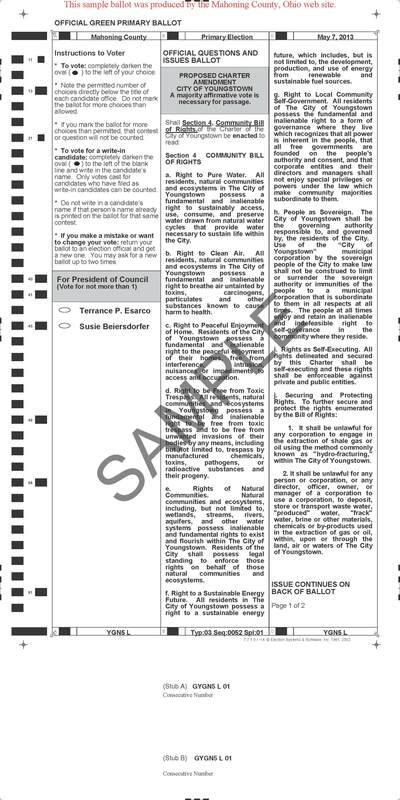 This ballot question is presented as the result of a citizen petition. The amendment proposes an addition to the Home Rule Charter establishing a local “Bill of Rights” which asserts the right of residents of the City to local self-government, to pure water, clean air, peaceful enjoyment of home, freedom from toxic trespass, local self-governing rights and the right of residents to establish energy policies for future sustainability. It establishes rights for natural communities and ecosystems, and empowers community members with legal standing to enforce those rights. To secure the local Bill of Rights, corporations would be prohibited from using hydraulic fracturing to extract natural gas within the City. In addition, corporations would be prohibited from storing, transporting or disposing of waste products from gas extraction within the City, or to site infrastructure supporting the extraction of shale gas or oil within the City. Corporations engaged in the extraction of natural gas, or intending to do so in the City, could not avail themselves of certain legal rights and powers which would enable them to nullify the rights of communities secured by the City Charter. Corporations engaged in gas extraction in neighboring municipalities could be held liable for violations of rights secured by this amendment.